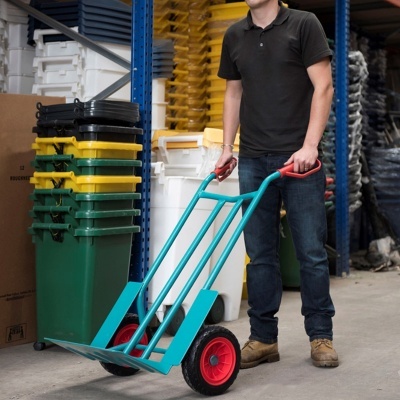 Our trucks and barrows can be used within a wide range of work environments to provide help with everyday manual handling tasks. 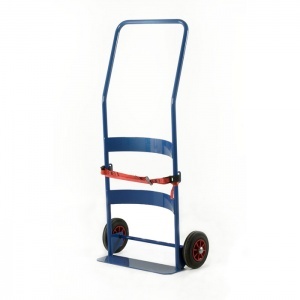 There is no need to struggle with large, heavy or bulky items when an inexpensive sack truck (or 'hand trolley') can make transporting goods a much simpler affair. Our range caters for just about every eventuality in the workplace. 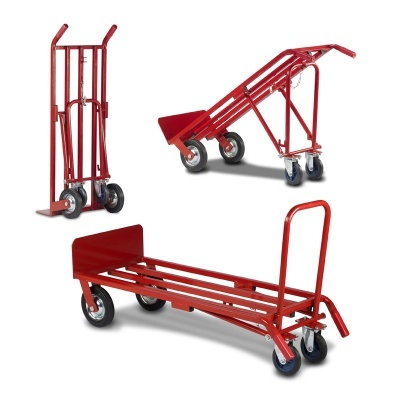 Cheap entry level, general purpose trucks are perfect for light occasional use, whilst specialist equipment such as stair-climbers and heavy duty industrial sack barrows are best suited to warehouses and factory duties. Whatever your need, we have the right piece of equipment for your business needs. Buy online via our secure shopping cart or if you need some help or if you have a large requirement then please call us on 01993 779494. 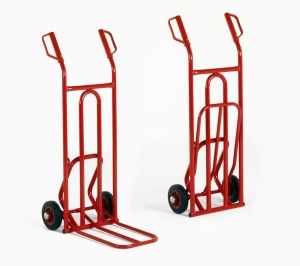 With so many different sack trolleys for sale it can be hard to know which one is right for your needs. The following guide will explain some of the options available to you when choosing the right piece of equipment for your business. 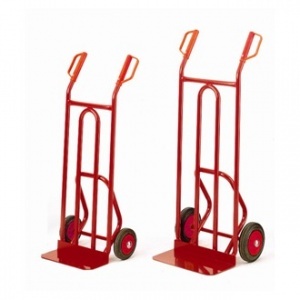 Entry level hand trucks can be bought for under £40 - representing excellent value for lighter duty or infrequent use. 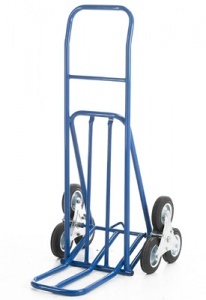 Even at this low price you can still buy a model that will carry around 100kg with ease. 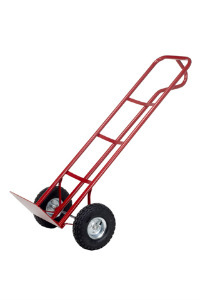 Budget sack trucks usually come with smaller wheels, fixed toe plates and standard handgrips. They will not be suitable for every job, but for most office or small stockrooms they will be an invaluable piece of manual handling equipment. 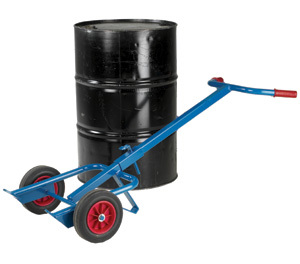 For businesses that need to transport very heavy loads, choose one of our many industrial grade products - some of which can carry up to 350kg! A stair-climbing truck makes life so much easier when items need to be moved between floor levels and there is no lift available. Three wheels arranged in a triangular formation ensure there is always a rolling contact point when moving over steps. 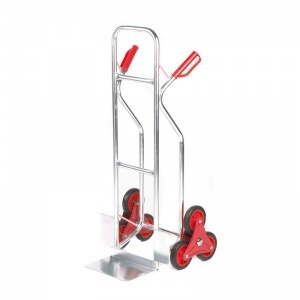 This allows you to smoothly manoeuvre your goods up or down to the next floor. Safety Note: It is not advisable to use stair climbers on open-back steps as the rear wheels may get stuck during operation. 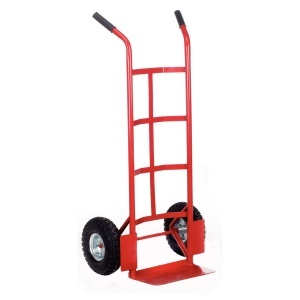 You will see from the variety of industrial sack trucks available that there are several different styles of handle to choose from. The most common being the 2 handle variety which provides excellent leverage and good stability in all situations. Loop handles feature a more ergonomic design that is more comfortable in continued use. Their unique shape gives a choice of holding points for the user to take up the most comfortable grip. 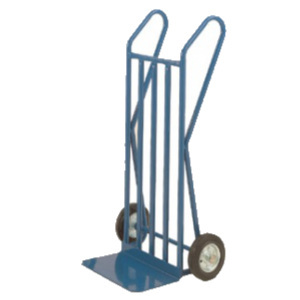 Sack trolleys are normally used to push goods around but in some work environments it can be easier to pull. In these cases, the versions with the somewhat strange looking 'P handle' are the best option as it provides a centralised grip that can be operated with just one hand - making it perfect for use through doorways and narrow corridors. 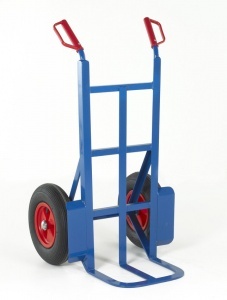 Generally speaking, the size of wheels fitted to your heavy duty sack trolley determines where it can be used. Small plastic or rubber wheels are best suited to offices and shops where there are nice smooth floors. 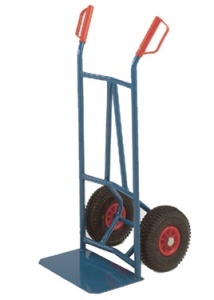 As wheels get larger in diameter, the wheeled trolleys are more able to cope with uneven ground. Opting for large pneumatic wheels gives your heavy duty hand trolley true off-road ability but of course you do risk getting a puncture!